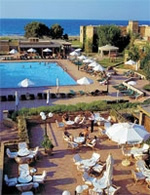 The Bella Maris is found in a beautiful stretch of sea in the centre of northern coast of Crete. This exceptionally select hotel has built with the local brick and the marble and the general leaves of calm with a permanent impression grandeur and comfort of past days. Relaxing region of lakes you it invites in laze far your interruptions, while he exists, naturally, many free time and athletic activities available for those that them prefer. You will leave of course the Bella Maris only after the promise of return of visit!